Some governments and organisations in Africa are starting to think churches should be held accountable to a being other than God. Of concern to many with interests in the Christian faith are the "prophet of God" or "man of God" churches. These are led by self-proclaimed prophets or messengers who are believed by their millions of devoted followers to have the power to perform a range of miracles from healing the sick, curing Aids and even raising the dead. But who dares take on these seemingly untouchable men? 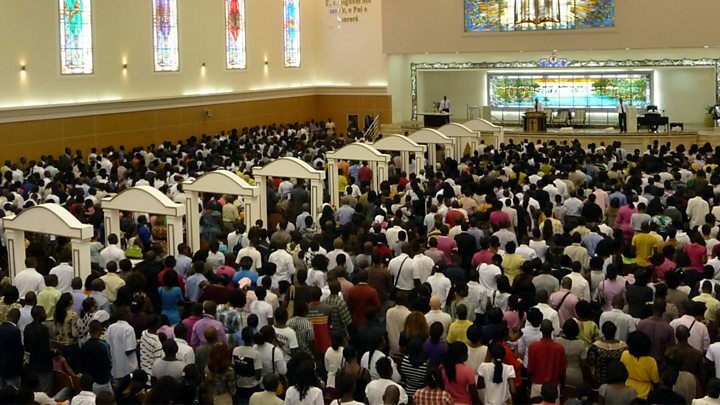 Kenya's President Uhuru Kenyatta recently called for the regulation of churches. The government there says the move is aimed at stamping out bogus churches. "They are thieves and not preachers. We have to consult and know how to remove them," the president is quoted as saying by Kenyan newspaper Daily Nation. When approached for comment on the scepticism around their sometimes bizarre practices, the response is often a variation of "we are being targeted" or "the Bible says the man of God will face opposition. Christ himself faced opposition". But the controversy is not unique to Kenya. Nigerian evangelist TB Joshua made news following a building collapse at his Synagogue Church of All Nations church in Lagos, which killed 116 people. A coroner's report blamed the collapse on shoddy work, saying the structure had not met safety standards but Mr Joshua's church denied this, instead blaming the collapse on a mysterious plane which had been flying above the double-storey building shortly before it was reduced to rubble. Of those killed, more than 80 were from South Africa, illustrating the international nature of some of the bigger churches. In South Africa, two churches - Rabboni Ministries and End Times Disciples Ministries - made headlines here when the churches posted images of their leaders feeding followers snakes and rats, or instructing congregants to drink petrol and eat grass. The images caused a nationwide outcry. At the time, the man dubbed the "snake pastor" by local media, Prophet Penuel Mnguni, said he was "doing God's work and didn't need to explain God's ways to people". Having tried to contact the prophet a number of times without success, I set off to locate him in the last place he was known to hold services. In the scorching Pretoria heat and after hours of driving, one resident, in extension 13 in Soshanguve, a township outside the capital, told me my search was futile. "It's Sunday but you won't find him anywhere here. He'll never come back here. We burnt his church and chased him away," he said. "Some people threatened to kill him if he ever returns. People here are angry at what he did - that's why he ran away." A few other people confirmed the "ban" and that seems to be the end of that. Some organisations are also curious about the business of the church. South Africa's Commission for the Promotion and Protection of Cultural, Religious and Linguistic Communities (CLR) which summoned 40 churches, said their wide-ranging sessions found that "commercialisation is definitely there… and abuse of people's belief systems". "The sector needs to be regulated," CLR chairperson Thoko Mkhwanazi-Xaluva told the BBC. "We've found that other religions such as Islam and the Jewish religion are systematised for disciplinary codes and monitoring but Christianity, because of its volatility in terms of anyone being able to start up their own church, we feel there is a need for regulation, self-regulation," she said. The challenge though becomes - whose role this should be, the government or the church body itself? Pastor Conrad Mbewe, of the Kabwata Baptist Church in Zambia, says charismatic churches have a stronghold on the continent because "Africans are hugely spiritual". "Africans do not question the existence of God as in the case with many in the Western World," said Mr Mbewe. "It is believed that there needs to be a conduit that enables communication between humans of the various layers of spiritual beings, which include angels, demons and spirits. They see these prophets as messengers from God," he said. He told me that financial swindling and sexual abuse were a concern for church leaders in Zambia. "We have been made aware of incidents of sexual abuse, which is said to take place when they attend overnight church gatherings." There is evidence that bogus churches target vulnerable people, Ms Mkhwanazi-Xaluva told me. "Issues of poverty and unemployment are at the core of people's reliance on these types of churches. We've found this group is incredibly desperate and will do whatever they are told to do if promised that it will change their lives." This is not to say all evangelical churches are bad, the same way we cannot say all orthodox churches are good and without controversy. The majority of the Christian community and its leaders are well respected here. The South African constitution allows for "freedom of religion". This means the constitution protects everyone's religion, as long as it acts within the ambit of the law - this also makes it easy for anyone to start a church. Reverend Moss Nthla of the Evangelical Alliance of South Africa, which has more than three million members, accepts that the Christian family is facing many challenges but says the government cannot be called upon to address spiritual matters. "It is difficult to see how the government would regulate churches; we've got reports of politicians themselves being faithful members of some of these controversial churches - some of which are a law unto themselves." "There needs to be at the very least, a bare minimum standard that we as Christians can set and adhere to and any church found to be operating outside of that needs to be stigmatised. We would have failed as church leaders if we do nothing," said Reverend Nthla.